DID YOU KNOW THAT THE SKINS NATURAL ABILITY TO DEFEND ITSELF REDUCES SIGNIFICANTLY WITH AGE? 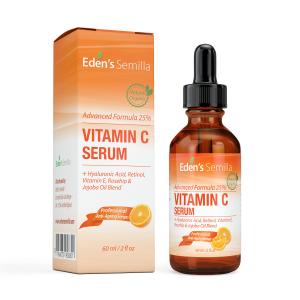 Our serum contains a powerful advanced blend of clinically proven Anti-Ageing Ingredients – SUPER STRENGTH 25% VITAMIN C – potent antioxidant protection against premature ageing caused by (free radicals) found in the environment; air pollution, the sun and other everyday contaminants. 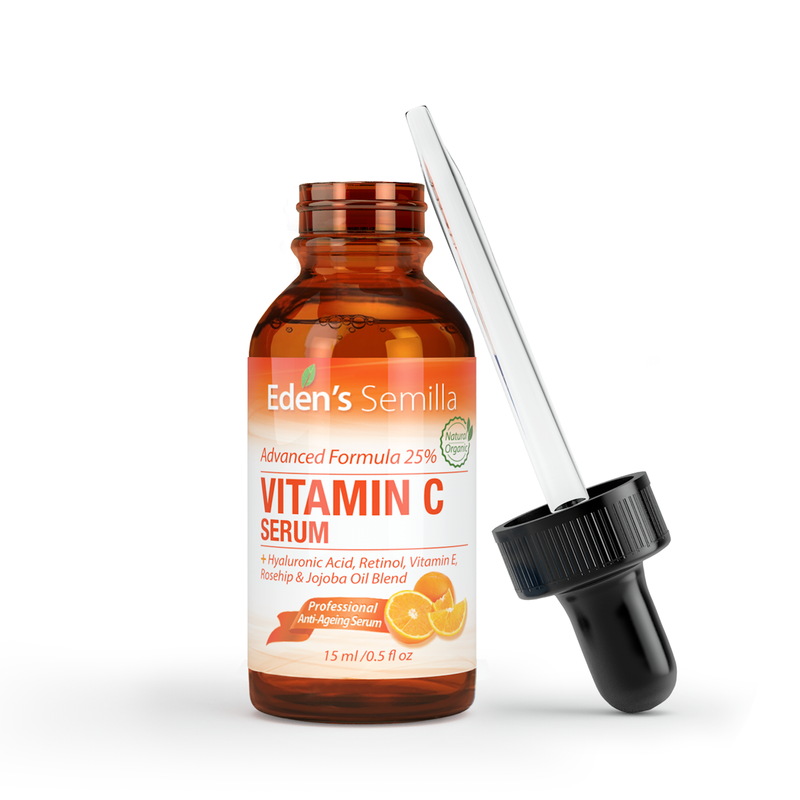 Vitamin C is essential for the production of collagen, a protein that keeps skin firm, elasticated, strong and healthy. 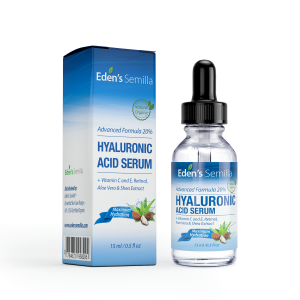 HYALURONIC ACID – This super charged ingredient is what the skin produces naturally to retain moisture making the skin softer and smoother. RETINOL – The superstar of all round skin protection. Targets fine lines and wrinkles. 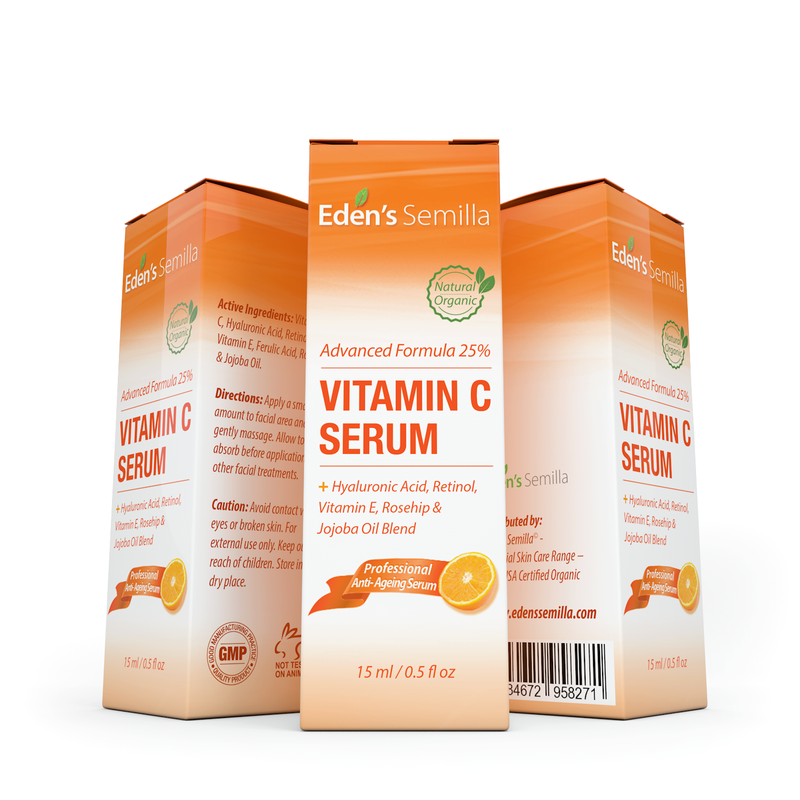 VITAMIN E – A powerful antioxidant containing anti-inflammatory & wound healing properties. An excellent moisturiser that is easily absorbed by the skin..
100% ORGANIC ROSEHIP & JOJOBA OIL – Natures gift for healthy looking skin. 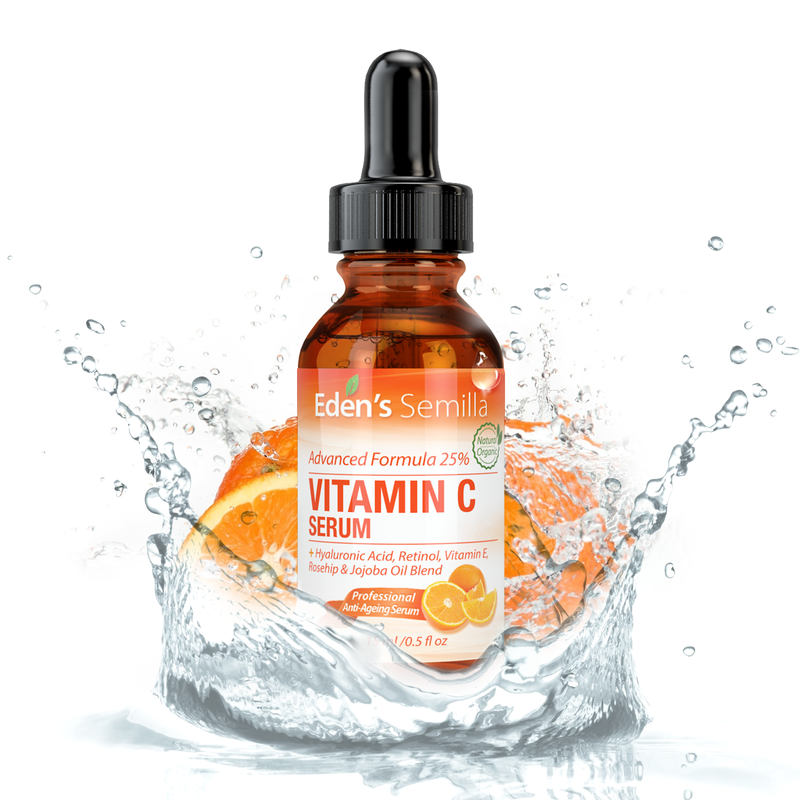 A wonderful blend of natural ingredients perfect for all round skin protection. Highly absorbent, non greasy and perfect for sensitive skin. 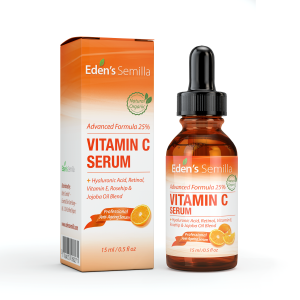 A wonder product that on it’s own can be used to treat acne; dry or irritable skin and can even help to reduce signs of scarring, stretch marks, skin pigmentations and more. PROTECTION FOR SENSITIVE SKIN – Only the purest ingredients. Free of parabens (preservatives) and sulphates. Fragrance free and produced to the highest levels of manufacturing standards. Vegan friendly and certainly not tested on animals! 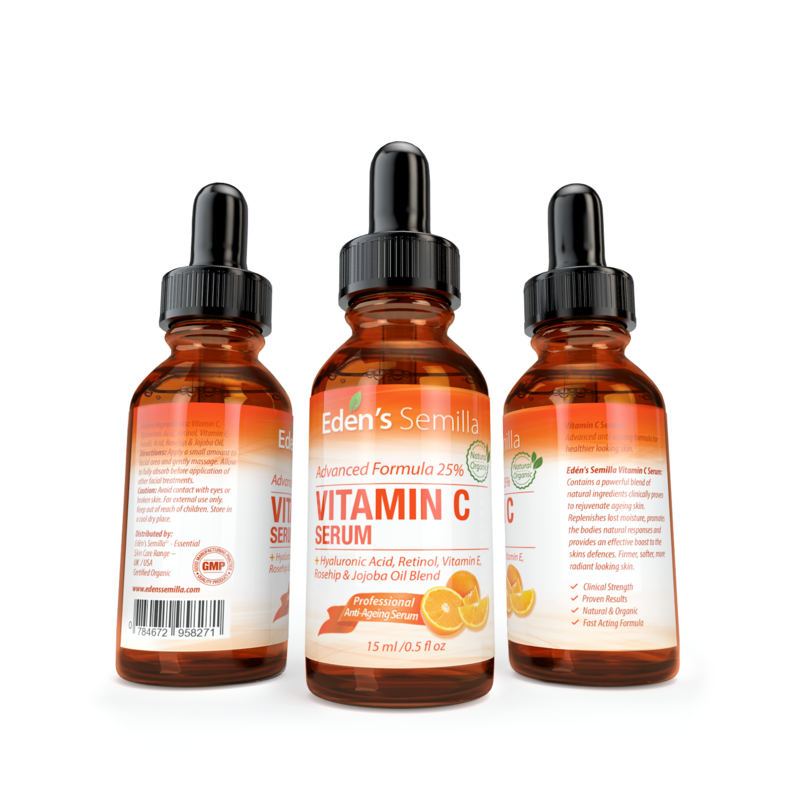 100% MONEY BACK GUARENTEE – We have absolute conviction in our Vitamin C Advanced Formula. The clinically proven ingredients and natural blend speak for themselves. If however you are not satisfied for whatever reason we offer a no question asked money back guarantee.